Women everywhere are increasingly on the grind. According to the Department of Labor, mothers are the primary or sole earners for 40 percent of households with children under 18 today, compared with 11 percent in 1960. Another 40 percent of women in the workforce have obtained college degrees, which is nearly four times the amount since 1970. Whether you’re a woman studying in college, a mother maintaining a household, building a business from the ground up, or a combination of all three — the modern 21st-century woman does not have time to spend on trivial tasks. Luckily for the hard-working women of today, personal technology has vastly evolved to help with the increasing share of everyday tasks. With that said, here are five time-saving tech tools. The IFTTT app is a lifesaver for anyone trying to eliminate reasons to take out your phone or complete a quick action. If This Then That app, connects apps on your phone/smart devices and seamlessly automates basic to advanced tasks you would normally have to complete manually. For example, you can make an automated setting to turn on Wi-Fi when you arrive home or turn it off once you leave home. Make an automation to add every music video you like on YouTube to be automatically added to a Spotify or Apple Music playlist. You could also enter the items you have in your fridge or on a shopping list, and sync them up with another app to generate recipes using those ingredients. These automated tasks are completed by grouping the apps into collections called applets. There’s an endless amount of combos and commands, as there are over one billion applets ran monthly. Daily commuting plagues most adults in metropolitan cities. You’re driving to class, rushing to work or fleeting to pick the kids up from school and the worst happens … you land smack in the middle of a traffic jam and all of the night’s plans are in jeopardy. 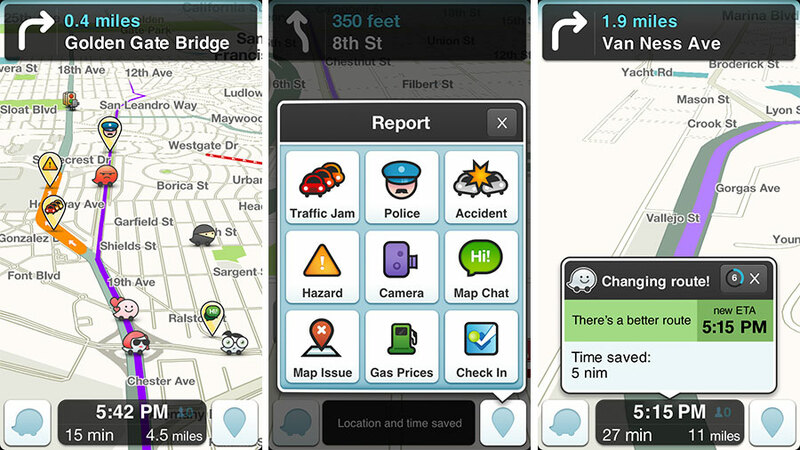 The Waze app often saves drivers minutes on their daily commutes, and in some cases, hours. Since the app’s growth and acquisition by Google, there has been some disdain from city officials about residential street usage, but the company maintains that they strive to use all streets and implement the fastest routes. It’s often easier to give advice than run your own life. Having an assistant to help monitor your daily actions is the first step to saving time and increasing efficiency. timeStats Planner runs in the background on your phone, computer or tablet’s applications and reports the time spent, times opened and a number of other advanced stats to help track your work rate and when/why you get off task. This is an excellent app to use in conjunction with the previously mentioned IFTTT, as you could run timeStats with your social media or entertainment apps and have them automatically close after a certain amount of time used or after a number of times being opened. Using all of these new time saving tech tools, many of them simultaneously means it’s increasingly important for hardware to perform well. Apps are only as effective as the hardware they’re operating on, and nothing can set you back quite like an unexpected system crash or a phone dying faster than usual. Qualcomm Snapdragon provides the fastest mobile processor available and has an abundance of additional benefits for busy schedules. The mobile processors allow for faster-charging speeds, longer lasting battery life, enhanced camera functionality, increased network connectivity and top notch security. Snapdragon also boasts machine learning technology that allows your device to learn and adapt to your everyday tendencies. Modern society has caused women to increase their productivity professionally. And be more efficient with personal responsibilities. Moving with speed and efficiency is as important as ever. Let go of the lag and get with the times of tech-assisted time savers. Would love any suggestions you might want to share of your time-saving tech tools.